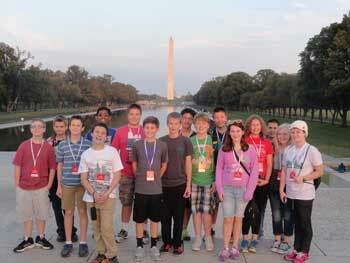 Templeton students travel to Washington, D.C. - Hamilton School District. An extended trip to Washington, D.C. Oct. 8-10 left 16 Templeton Middle School students and two teachers with unforgettable experiences. The school group visited Mount Vernon, U.S. Capitol, National 9/11 Pentagon Memorial, Air Force Memorial, Holocaust Museum, the White House, U. S. Supreme Court, Library of Congress and many of the war memorials, including the Lincoln, Korean, Vietnam, Iwo Jima, Jefferson and Martin Luther King, Jr. The seventh and eighth grade students participating in the field trip included: Elizabeth Barnish, Joseph Davila, Sophie Detweiler, Quintin Dietrich, Samuel Farmer, Samuel Henderson, Mitchell Hicks, Jacob Holzhauer, Noah Kusserow, Julia Lenz, Jakob Nowak, Shiva Senthil, Jennifer Spence, Nicholas Strauss, Noah Strauss, and Joseph Vang. The teacher chaperones were Alan Schneider and Rhonda Watton.